Summer berries to the rescue! I have officially cracked the berry fastest way to serve cupcakes. If you need to produce something in a hurry or donate something visually impressive to the school fete then look no further. For my son’s recent cupcake decorating party I indulged in buying 99p store cupcakes. The concept of the shop bought cupcake base was introduced to me by Crumbs Claire and Lucy when I recorded some cheat’s cupcake decorating videos with them last year to “pimp up shop bought cupcakes”. I have *ahem* now taken this a stage further in assembling these babies without making icing and without making anything myself to go on top. If I’m honest, the versions that Crumbs Lucy and Claire used had floppy wrappers and crumbly texture which made me think I’d come through life not knowing one could buy blank cupcake bases with good reason. But finding a better brand has been a revelation. For Ted’s cupcake decorating party (blogged alongside the Google birthday cake last week) I was desperate and honestly, what’s the point of making cupcake bases for five and six year olds to throw icing and sprinkles at? It turned out that my local 99p store cupcake bases were much much better than the ones I’d seen before – the 99p store also sells real French brioche and croissants so possibly I’ve been missing a trick all along. Their eight pack of sponge bases for 99p were very good indeed and perfect for “pimping up” and donating to fetes and bazaars whose pricing policies seem permanently stuck in 1987 at 20p ago (I live in a cheap area clearly). But more of what I did with the cakes below. 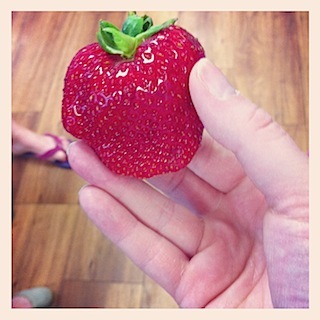 Recently I spent a berry nice evening tasting Tesco strawberries. I get all the best jobs. 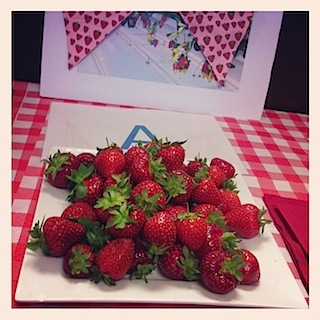 We did a mystery tasting on the basic strawberry, the mid range strawberry and the Finest range strawberry. Some people claimed to like the cheapest ones most. I’m proud to say the Tesco Finest range were my favourites. I must have expensive taste. Look at this whopper above. We were also treated to various things to dip our strawberries into like double cream and Greek yogurt but being on a diet right now meant I ate mine unadulterated. I have been compiling a big list of things to do with berries which I’ll probably publish on BabyCentre and draw your attention to when it appears. People do say that larger strawberries have less flavour but actually the biggest thing that will kill strawberries’ flavour is being served too cold. Boost the flavour and smell of your strawbs by getting them out of the fridge a generous hour before you intend to serve them. 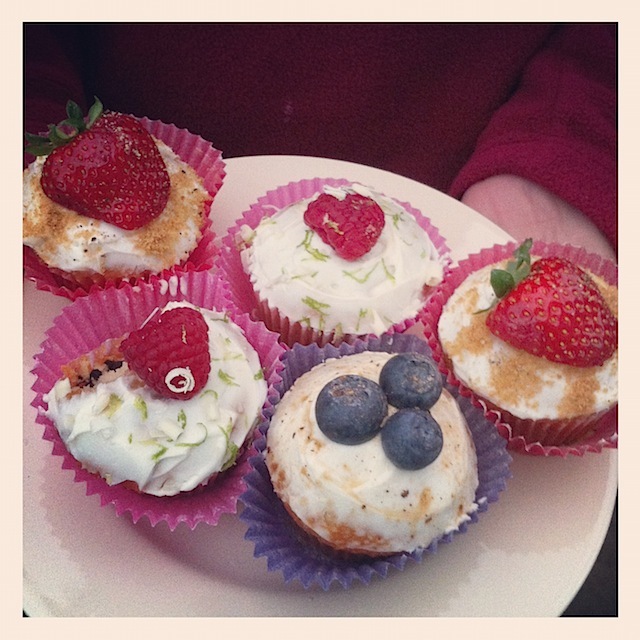 So I came home with a selection of berries and still had the shop bought cupcake bases left over from Ted’s party. I thought I’d do a range of toppings using stuff I had in the fridge. Cream cheese frosting is a bit of a nightmare in my opinion. The slightest whip and it goes all watery. I’ve ended up with some right disgusting messes in my time and come to the conclusion that for cream cheese frosting all you actually need is slightly softened cream cheese with sugar sprinkled on it. 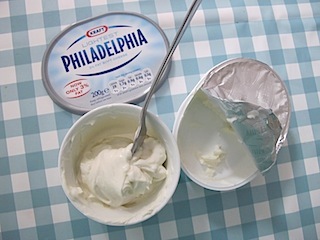 I know that full fat Philly is the way to go but seriously, even cream cheese icings made with this have been far too floppy and no quantity of icing sugar appears to be able to stiffen it up as the more you beat the sugar in, the more it gets runny and so on. So sod that. 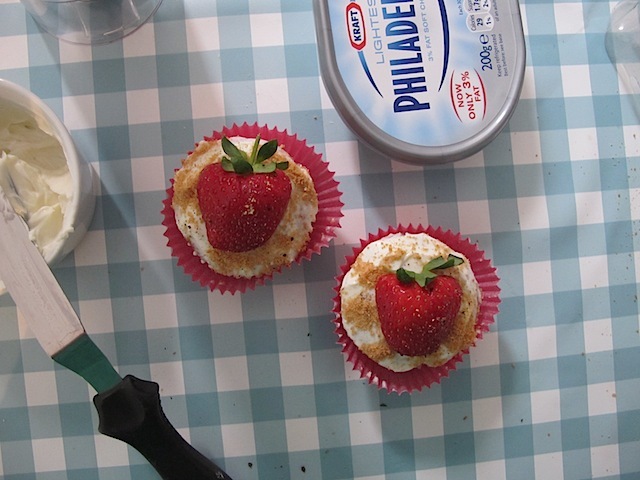 Let’s just paste Philadelphia light direct onto cupcake bases. What’s the worst that could happen? 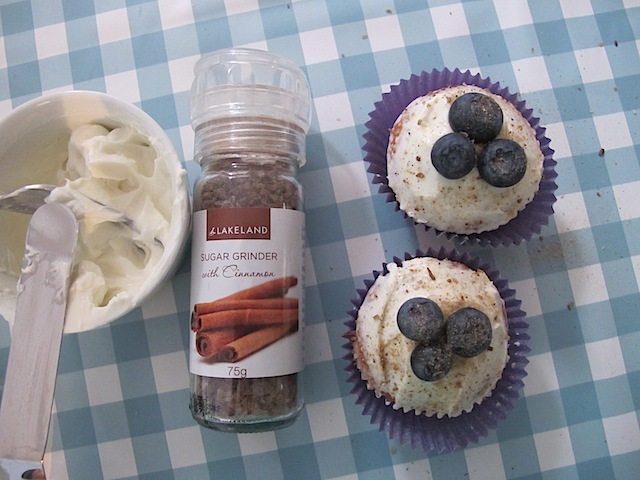 I popped three blueberries on top and gave my Lakeland sugar and cinnamon grinder a good going over the top. Simple. Next up was raspberry. I have a raspberry tart in a similar fashion in the offing but here is the mini cupcake version. 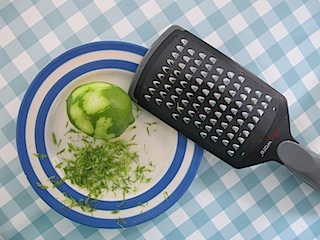 Simply slather low fat Philly on top and grate over white chocolate and lime zest. The 99p Store cupcakes are further perked up with an extra cupcake case in a co-ordinating colour. Then I sliced strawberries in half and sprinkled over some of my speculoos crumbs that I have ready blitzed up in a jar for such occasions. So there you have it, seriously Slummy Mummy Fruity Cupcakes that actually, are considerably healthier and Yummy Mummier than ones covered in sugary stuff. A final word on storage – these are best served within a couple of hours. Overnight the cake bases do absorb some of the cream cheese so the next day they look less effectively covered than on making them. But they’ll be fine to eat for a day or two if you keep them in the fridge. The fresh fruit really won’t cope with 3-4 days in a tin so don’t try this. With thanks to Tesco Real Food for berry gift bag including a voucher. I was under no obligation to publish this post and all views are my own. « It’s my 40th birthday. Do I really *really* want a stand mixer? Great idea! I’ll have to seek out these 99p store cupcakes, I’ve tried the tesco plain ones for similar purposes, but they haven’t been amazing. Cream cheese frosting is a tricky beast indeed, the trick (I think!) is to have the butter very soft and fully incorporated with the icing before adding the cream cheese COLD and beating for a short period of time – too much beating makes it runny (and very hot days). Good tips – glad to hear it’s not just me having problems with it! Loving these Sarah. 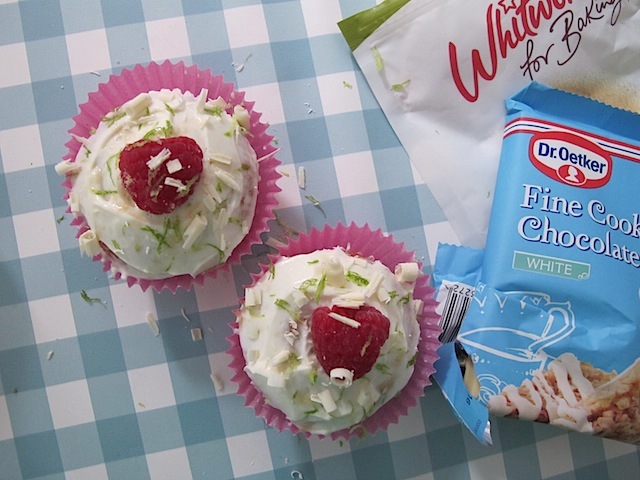 And who on earth would think that fruit decorated cupcakes would last for more than an hour or two – let alone 3 to 4 days in a tin!